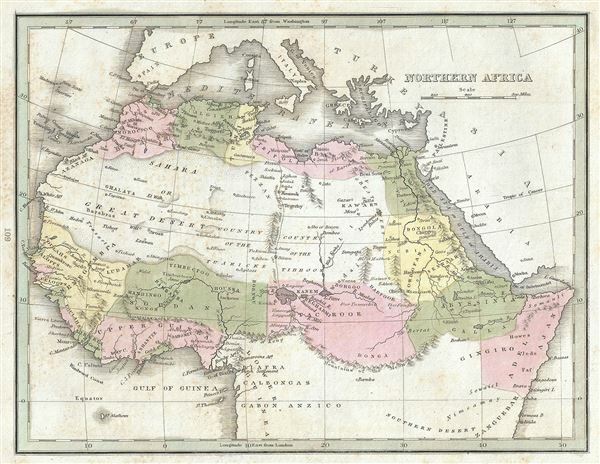 This is a fascinating 1835 map of northern Africa by the important American mapmaker T. G. Bradford. It covers the northern portion of Africa from the Maghreb or Barbary Coast south as far as Gabon. Ancient Greek and later Roman, Byzantine colony of Barca is noted. It also shows the inland oasis Kingdom of Fezzan. Though mostly desert, 19th century Fezzan had numerous oases and supported a relatively large population. This desert kingdom was a critical stopping point for trade caravans crossing the Sahara since antiquity. The desert area is largely unmapped, but names numerous African tribes and nations throughout including the Tuaricks and the Tiboos. West of Timbuktu the city of Walet (said to be larger than Timbuctoo) is also identified. The routes of Denham and Clapperton. Bradford maps the mythical 'Mountains of Kong' extending eastward to join with the 'Mountains of the Moon.' According to Ptolemy, the Mountains of the Moon lay near two great lakes that were source of the White Nile. Today some regard this range and its lakes as speculative, but more likely it represents Ptolemy's very real knowledge of Lake Victoria and the Rwenzori Mountains. In any case Bradford makes the curious decision not to map the Ptolemaic Lakes, though he does maintain the Mountains of the Moon, placing the source of the Nile there. To the west of the Mountains of the Moon Bradford draws a long mountain range called the Mountains of Kong. This speculative range was proposed by the explorations of Mungo Parks and was presumed to be the southern barrier to the Niger River valley. To the east Lake Tchad (Chad) is well mapped. The course of the River Shary is also noted just to the south of Lake Chad. Parts of North Africa and the Barbary Coast in particular at the time were under the influence of the rapidly declining Ottoman Empire. The region would go on to be colonized by France, United Kingdom, Spain and Italy during the next century. Western Africa was particularly important in the early 19th century as the source of most African slaves imported to the New World. Even so, at the time this map was made, the slave trade, thriving since the 5th century was rapidly diminishing due to decreased demand for slaves in the New World, the British outlawing of slavery in 1808, and subsequent diplomatic efforts including treaties with over 50 African rulers outlawing the practice. Many African economies adapted by shifting to the export of mineral and agricultural resources, which led to the European scramble for territory, occupying most of the continent by the end of the 19th century. Europe's colonial interests in Africa haphazardly carved up the continent into unnatural territories, often forcing historic enemies into close proximity and leading to social problems that remain to this day. The map was published as plate no. 109 in Thomas G. Bradford's 1835 Comprehensive Atlas Geographical, Historical and Commercial. Bradford's atlas, published in 1835 was an important work on many levels. First, it was one of the first American atlases to follow an encyclopedic format, offering readers extensive geographical and statistical tables to supplement the maps themselves. Second, it was published in Boston and influenced the city's rise as a publishing center later in the 19th century (at the time most publishing in the United States was restricted to New York and Philadelphia). Third, this atlas was the first to contain a separate and specific map showing the Republic of Texas. Fourth and finally, Bradford's atlas in some instances broke the Euro-centric mold regarding atlas production. Among other things, Bradford focused his atlas on the Americas and abandoned the classical decoration common in European atlases in favor of a more informational and inherently American approach.